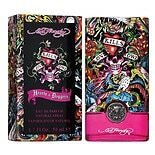 Shop Ed Hardy Hearts & Daggers Eau de Parfum Natural Spray (1.7 oz. )1.7 oz. Shop Ed Hardy Eau De Parfum Spray for Women (1.7 oz. )1.7 oz. $5499$54 and 99 cents$32.35 / oz. $7499$74 and 99 cents$22.06 / oz. Shop Ed Hardy Women Fragranced Body Mist (8 oz. )8 oz. If you're an Ed Hardy fan, we carry a number of Ed Hardy products for men and women, including the fragrances Ed Hardy Love & Luck and Ed Hardy Hearts & Daggers. From men's cologne and gift sets to women's eau de parfum sprays and gift sets, there's an Ed Hardy fragrance that's sure to suit you. Among Ed Hardy products there are signature scents for men and women, starting with Ed Hardy for Men and Ed Hardy for Women. If you enjoy Ed Hardy Hearts & Daggers, your partner may like the accompanying scent for women. Ed Hardy Love and Luck also comes in a version for men and one for women. Ed Hardy products also include gift sets of the Ed Hardy perfumes. Ed Hardy cologne gift sets usually include a perfume spray, a smaller version for travel and a shower gel. We carry a wide selection of women's perfume and men's colognes. You can find eau de toilettes, eau de parfums and colognes, depending on your preference for strength of scent. There are designer perfumes and celebrity perfumes available in different sizes as well as gift sets. Some scents are also available in multiple forms, including aftershave and body sprays.